Located in Lincolnshire on the South-West edge of Cranwell village, immediately North of the A17 and West of the A15, around 5 miles North-West of Sleaford. 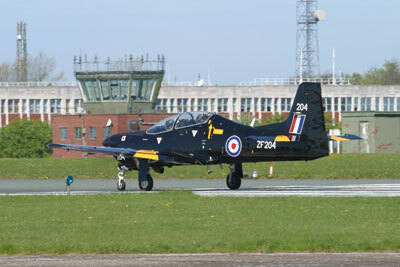 Only around half an hour's drive from several other RAF stations, Cranwell is one of the RAF's primary training stations and offers easy viewing opportunities but limited photographic viewpoints. 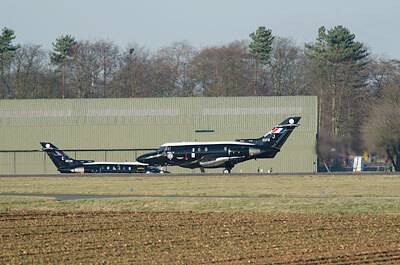 King Airs (Serco-leased 45(R) Squadron), Tutors (16(R) Squadron of 1 EFTS) and - sadly ground-bound - Jaguars (DCAE). 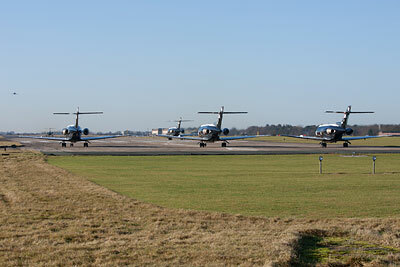 The latter are used for training in aircraft handling and if you are lucky you may see one taxiing under its own power. Activity is pretty constant, kicking off with a few departures after 08:00 but not really ramping up until after 09:00 on most days. From then on you'll be lucky to get 10 minutes' peace and quiet until the station closes for the night at around 17:00. King Airs are pretty unpredictable but often return within an hour of departure; similarly the Tutors do their own thing but sometimes bumble around in the circuit instead of going elsewhere. 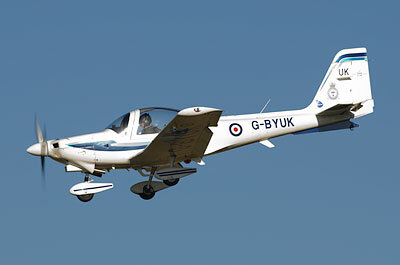 Occasional graduation ceremonies are held that involve flypasts or displays from visiting types. At weekends the main airfield is closed, but the smaller grass strip North of the B1429 (within the northern half of the station and not accessible therefore not covered by this guide) is open for glider operations. 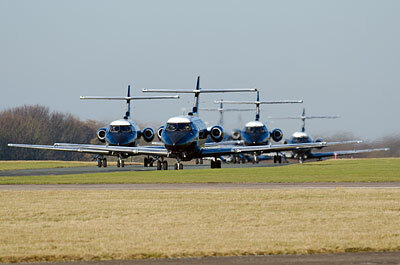 Assuming you're arriving from the A17 in either direction, your first stopping point is near the end of runway 09. There's a small turn off here towards Caythorpe (note it is not the B6403) and there is enough room on the East side of the road at the corner here for several cars to park (A), and if it's full there's plenty of places further along the road. From here, without straying more than a few feet from your car you have some good photo opportunities and a good scope or pair of binoculars should enable you to log many of the aircraft parked in front of the hangars visible across the road. 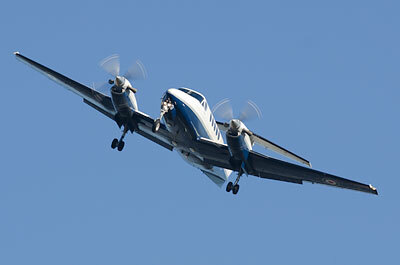 When 09 is in use you will have fine shots of aircraft on approach and landing, good until late afternoon. When 27 is in use you can get good shots of the jet types climbing out - not quite side-on but near enough; prop jobs are usually much higher so the best you'll get of them is an underside shot. Lighter types such as Tutors have often begun a turn to the South before they get this far, and distance and the sun will make photos pointless. A quick run across the road (B) may get a few more serials as will a walk further along the A17 verge, though as the A17 can get very busy, this is one of those unpleasant experiences you may wish to avoid! Occasionally visiting helicopters land at the Westernmost end of the apron and you can get nice shots of them until they touch down, when the lie of the land means their wheels or lower fuselage will become obscured. Back in the car and drive along the A17. There are four spots of dubious usefulness for a variety of reasons. First off there's a turn-off on the north side of the road by the radar tower (C); a fair bit of room to park well off the dangerous A17 but do you really want to sit under an operational radar for any length of time? This is as close as you can get to the runway but it's still pretty distant - 600mm+ really needed for photos from here. Next up there is a layby on the south side of the A17, which has the advantage of not making your gonads glow in the dark but offers no separation from the lorries thundering past right next to you (D). Just past the layby on the northern side of the road there is a small yard used by the local farmer (E). This is now pretty distant from the runway, but - assuming you're not moved on - is about the safest point to park on this side of the airfield, and the taxiway isn't quite so far. Still very big lens territory though. The next spot, of dubious usefulness, is further along the A17; just after a lane going south to a farm you'll see some trees on the north side of the road and then an entrance. There's only a small patch of gravel here and also a sign warning that you are entering a Prohibited Place so you can't get far off the A17 without trespassing on the airfield and inviting a visit from the MoD police. It is, however, about the only reasonable spot to view from if anything is landing on runway 01 (very rare - I've only seen it used once in about 20 visits). If moved on from parking here, the nearest safe place to park is so far that frankly I don't think it's worth the dangerous roadside walk to get back to this point so if the wind is forcing operations to use runway 01 you may be better off staying at home! Anyway, let's continue on the A17 to some more reasonable locations. Watch out for the speed camera (though at the time of writing it is out of use), and you soon get a chance to turn left towards Cranwell village. Incidentally, if you turn right here you'll shortly come to a right turn into the Cranwell Aviation Heritage Centre (G). 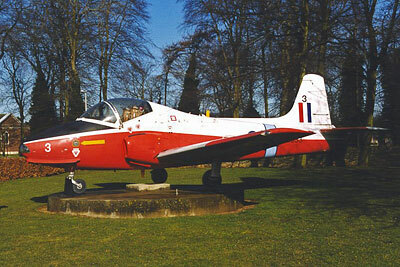 Open in the summer months, this small museum has a Jet Provost on display inside. From the car park there you'll occasionally get Cranwell aircraft flying overhead too - but I wouldn't recommend it as a general viewing point. Travelling up the road towards Cranwell, there's a track going off into the fields on your left (H), with enough room for a car or two to park in the entrance without blocking it. From here you may be able to log, but not photograph, any airframes in the dump area but it is rather hit and miss and generally the lie of the land will block any decent view. The apron by the hangar a little further North is now blocked from view by a raised bank. Back to the car and drive further up the road. At various points you may be able to see aircraft on your left but generally distance, foliage and other obstructions make most of this stretch of road very poor for viewing. However you will soon come to another station entrance, and, not far past that, a farm track on the right, leading east. Here (I) there is room for several cars to park at the beginning of the track but it can be very muddy and gets worse the further you go along the track. Please make sure you leave the track clear enough that tractors can get past. From here you can cross the road for views of the Tutors on the apron nearby; again buildings can obscure some of them so a bit more hiking up and down the road may be necessary to log them all, or photograph specific airframes. There is a hedge, but it is usually kept fairly well trimmed and anyone of average height shouldn't be bothered by it - or should be able to find a part that isn't quite as high as the rest. Alternatively, a small stepladder could be useful. Walk a little bit further North and you'll be near the start of runway 27 (J); pictures of anything departing are so-so as they tend to be quite high by this point; jets are lower though. Aircraft on approach are easy to take shots of, as the landscape is flat and you have plenty of warning that they're coming in. A 300mm or 400mm lens will also give you enough reach for some decent taxiing shots of aircraft taxiing onto runway 27 - this is the only location at Cranwell that really offers a decent selection of photographic opportunities. The sun is generally south of the centreline for most of the day. Back into your car and continue driving North. Shortly past the stop lights there's a rather muddy and uneven layby on the right (K), room for one or two cars maximum, offering no advantage over the previous spot unless that's already full up. Continuing up the road, turn left at the junction and you'll see a nicely kept area of grass with a few trees on your left. There is a spot where you can pull over off the road (L). Go up to the hedge - not beyond the sign warning of an active airfield - and you can get fairly distant views of the airfield from here; King Airs that have landed on 09 can taxi in front of you, round the corner and past the tower, disappearing out of sight behind the trees to the North of the station (and of course in the reverse route if departing from 27). Trees and buildings further West from this spot block other views of the airfield, but if runway 19 is in use then you can walk from where you have left your car to a spot around final approach (e.g. M) to try and catch some landing shots. Use of runway 01/19 is, however, rare as the prevailing winds are from the west. If you keep driving to the West you can rejoin the A17, passing through the middle of the station. The main guardroom is on your left (look out for a sign asking visitors to park behind the guardroom); if you want a picture of the Jet Provost gate guard, pop in here and ask permission, they normally don't mind. The JP itself is further along, easily visible from the road on your left (N). 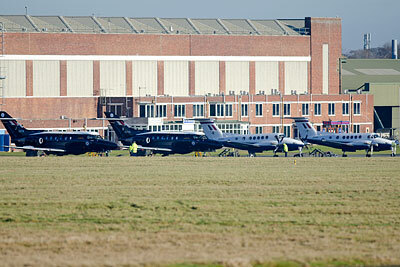 The famous RAF college, an impressive looking building, is further along on your right. The general attitude to spotters at Cranwell is pretty relaxed - it rarely gets mobbed here and most people stick to point A if staying any length of time and I if visiting to see something specific (e.g. an unusual visitor or flypast); use of the track at point I is usually tolerated as long as people are sensible however the police have been known to close it off when large crowds are expected. Petrol and shops available in Sleaford; there is a newsagent in Cranwell village too. The village also has a churchyard with many RAF and Allied graves, worth a visit to pay your respects. Graves date pretty much from the station's establishment to the present day and illustrate what a dangerous business flying training can be. RAF Waddington is about 20-30 minutes away (depending on traffic) to the North via the A15, RAF Coningsby is about 30 minutes away to the East via the A17 and A153 and RAF Barkston Heath is about 15 minutes away to the South via the B6403. Contributors: author, Phil Carlton, Milscanners.